One of my New Year’s resolutions is to foodblog more often. I think you’ll agree that I’m off to a nice start. This is a delicious vegan side dish that can be ready in about 15 minutes, not including prep time. 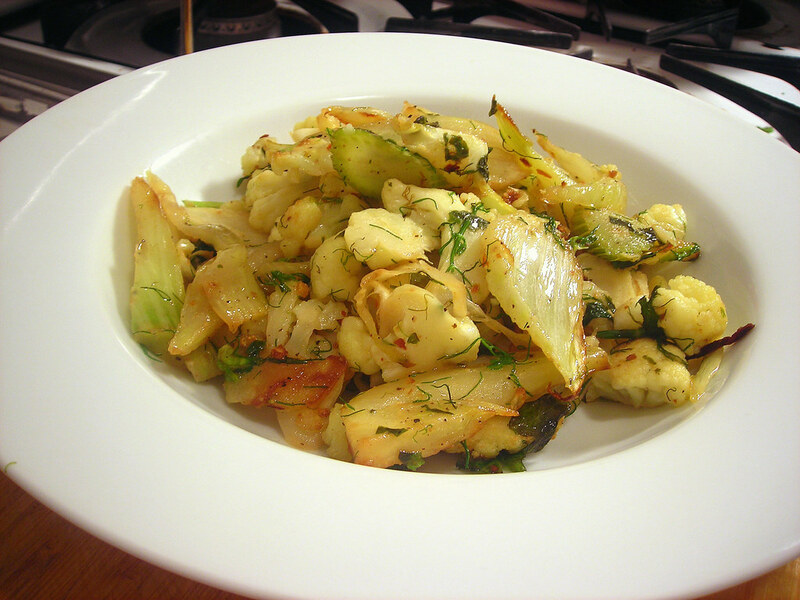 Thinly slice a fennel bulb and half a head of cauliflower, then cook in a generous amount of olive oil over medium-high heat until vegetables are softened and tender. Stir frequently to prevent the vegetables from burning. Season to taste with salt, freshly ground black pepper, dried chile flakes and lemon juice. Stir in 2 tablespoons chopped mint leaves and chopped fennel leaves prior to serving. Toss quartered baby Yukon Gold potatoes with olive oil, salt and pepper, then roast for 35 minutes at 375 F. Meanwhile mince one scallion and a small handful of parsley. The vinaigrette consists of the juice of half a lemon, 2 tablespoons extra-virgin olive oil, salt and freshly ground black pepper. 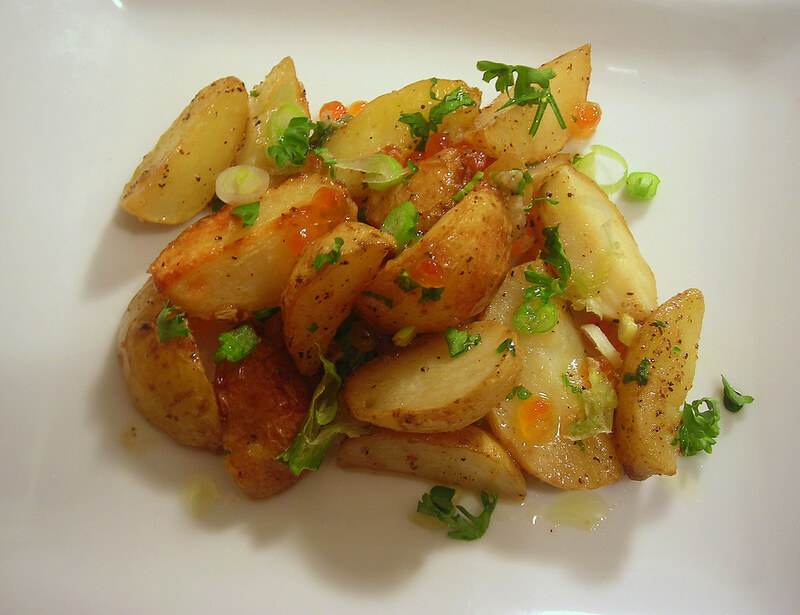 When potatoes are done, add scallions and parsley to roasting pan. Stir in one teaspoon salmon roe. Mix well, then spoon onto individual serving plates. Lightly dress each portion, then serve at once. Time: 45 minutes, including prep time. The salad dish is my submission for Souper (Soup, Salad and Sammie) Sundays for the week of January 2, 2012 to January 8, 2012, a weekly foodblogging event organized and hosted by Deb of Kahakai Kitchen. 02 Jan	This entry was published on January 2, 2012 at 1:28 am. It’s filed under food, vegan, winter and tagged cauliflower, fennel, food photography, potatoes, recipe, salad, side dish. Bookmark the permalink. Follow any comments here with the RSS feed for this post. I very much enjoy your postings; so ‘more of them’ is a good vote yes from me! I’m experimenting with a new food blog theme that emphasizes the photography. Most of the meals that appear on the blog were made by me; the few that are not were eaten at restaurants or at friends’ apartments. I always make clear when that’s the case. This sounds really interesting with the salmon roe. I definitely prefer potato salads with oil and lemon/vinegar dressings rather than creamy ones so it’s something I might try. Hi Corina. It’s easy to go overboard with the salmon roe. You want just enough so that the potatoes remain the star of the show. Let me know how it turns out, if you happen to make it. I noticed the theme right away. I love light and bright minimalist themes — especially those that showcase the photography. Very nice — as are the recipes. We don’t eat a lot of fennel for some reason and I need to change that!